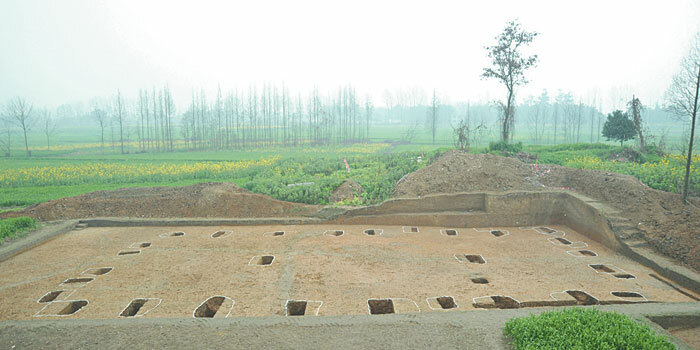 From 1995 to 1996, the Archaeology Institute of Chengdu investigated and test excavated the Baodun site, and found the inner city (about 60 ha) of the site. This inner city could be dated to the Baodun Culture (about 4500-3700BP), which included the Pixian ancient city and the Dujiangyan Mang city as well. The Baodun Culture could be primarily divided into four phases and the Baodun site could be dated to Phase I & II. In order to further explore this culture’s origin, subsistence pattern, settlement layout and change, relationship between human beings and environment, and social development etc., also in order to complete one of the sub-projects of the Exploring the Chinese Civilization Project---“A study of the settlement pattern of the Xinjin Baodun site”, the Archaeology Institute of Chengdu again carried out a field work at the Baodun site since the end of 2009 and found an outer city covering an up to 276 ha area. While, the field work during 2010 and 2011 mainly included coring a large area and excavating the key locations, and great achievements were obtained. The purpose of coring is to know the distribution of the cultural remains, the landforms and the environment at the site, laying a solid foundation for understanding the settlement pattern and change. The excavation mainly included the small-scale test excavation covering a 100 square meters area in 2009. In October, 2010, the excavation area increased to 1800 square meters from the original 800 square meters due to the discovery of a large-scale architectural foundation, while the excavation area in 2011 was 1000 square meters. The excavation area mainly concentrated in Tianjiaolin, Gudunzi of the center of the inner city and in Luolinpan of the southeast of the outer city. There were three large-scale architectural foundations, more than 130 ash pits and two pit tombs discovered. On the north of Gudunzi, there were three large-scale architectural foundations discovered, which were of alignment on the south-north. Among them, F1 was a “品”-shaped architectural complex in east-west direction and it was centered as a square main house with the ancillary buildings on both south and north sides. Its entire layout was of symmetry with a primary and secondary distinct. F1 was not preserved well and only has partial mat soil and postholes retained. The main house was paved with pure loess and was about 20 meters long in south-north by about 10.5 meters wide in east-west, covering about 210 square meters; among the remained twenty-eight postholes, there were eight in south and north sides respectively and two inside the house. When the ancillary buildings were built, the ground might have been artificially leveled. The ancillary building in the north was about 10.5 meters in south-north long by about 7.5 meters wide in east-west with nine postholes remained which were three rows by three columns, while the ancillary building in the south was about 9 meters long by 8 meters wide with 5 postholes remained. The space between postholes in the same row varied slightly, while the space between columns in south-north was 2.5 meters and the space between rows in east-west was 2 meters. The postholes around the house were arranged orderly and the space between them was same. However, the walls were not remained. F2 is located in the north of F1 which is 13 meters away from F2. It was about 9 meters long by 8 meters wide and faced to the south. F2 had two rooms in length and two rooms in width. It also had 17 square postholes which were arranged orderly and had the same spaces. F3 is located in the south of F1, which is about 22 meters distance. It was about 24 meters long in south-north by about 12 meters wide in east-west, covering a 300 square meters area. Among the 28 posthole remained, there were eight situated on the east and the west sides respectively, five on the south and the north respectively and two inside the house. The layout of the postholes was basically identical with that of F1. Most of the postholes were square with a side length varying in 0.8-1.1 meters range, while some of the postholes had up to 1.5 meters side length. Few postholes were rectangular. The postholes had near straight walls and flat bottom. There was no rammed trace in the filled earth which was solid and hard. Inside a few postholes, there were pebbles paved on the bottom. F1 was superimposed by the cultural layer dated to the Phase III of the site, whose chronology was no earlier than the end of the Phase I of the Baodun Culture. The cultural layer where F2 and F3 were located was damaged heavily by intrusion. Three groups of architectural foundations were laid out regularly but it is hard to distinguish their relative chronology from the cultural layers. However, it could be confirmed that all the three groups of buildings were located in the geographical center of the inner city and their architectural patterns were totally different from the large number of common architectures dating to the Baodun Culture and they might have been large-scale public ritual buildings. Ash pits included near square-, rectangular-, oval- or irregular-shaped and contained varied numbers of fillings but the majority were potteries with a small number of stone tools. There were two pit tombs discovered as well, which were narrow rectangular. The human bones inside the tombs were preserved badly and no grave goods were found. There were two categories among the cultural relics, potteries and stone tools. The pottery production modes were mainly clay-strip forming technique and slow-wheel processing method. Pottery included temperless and sand-tempered potteries and the former is more than the latter in quantity. Among the temperless potteries, the majority were temperless grayish-white pottery and grayish-yellow pottery, while the sand-tempered pottery was mainly gray pottery. The patterns of the potteries varied. Among the temperless potteries, the majority were engraved lines, stamp images and additional heap patterns, and the monitory were thin-lines, tile ridges and rotation patterns, etc. ; the sand-tempered pottery mainly decorated with string pattern. The types of the potteries were mostly flat-bottom artifacts and ring-foot artifacts, but no round-bottom artifact was found. There were two tri-foot artifacts newly discovered. These artifacts were mostly flower-rim jars with string patterns, ring-foot zun 尊 pots with open mouths, high neck pots with bell mouths, flat bottom zun 尊 pots with wide edge and kettles. Stone tools included axes, adzes, arrow heads, knives with holes and so on. Red pigment could still be found on some stone tools. In addition, integrated with multi-discipline research, botanical archaeology research and environmental archaeology were also carried out. In the field work, sampling and flotation were systematically carried out and many plant seeds were collected. Among the collected samples, the majority (45%) was rice seeds, which were discovered in all cultural layers and features. The second (1.6%) were millet seeds, which mostly occurred in the cultural layers dating to the Phase I of the Baodun site and their features. Additionally, coix seeds, wild species and weed seeds were discovered as well.